We continue to place highly in categories in the U.S. News & World Report annual rankings. See our full list of ranked specialties. To accomplish our mission, we call upon the skills and expertise of all of our medical professionals, who work together in collegiality to advance medical innovation, serve the health needs of the community and further the knowledge of those dedicated to caring. What are our PRIDE Values? The PRIDE values outline how we expect members of the University of Chicago Medicine team to behave at work. It is critical that each individual holds him or herself, and their colleagues, accountable to living the PRIDE values so that we may deliver the best experience possible to our patients, their families and visitors. How Do Our Employees Live Out the PRIDE Values? The finest, most efficient care is best measured by those who proudly provide it. Each value listed below has a clear, concise definition so that we can all meet those expectations and make a difference every day. Follows through on commitments, engages with others, offers new ideas to achieve objectives and advance the mission of the organization, works collaboratively with others, demonstrates teamwork and support of co-workers, takes initiative to act and get things done, performs at the highest level every day. Recognizes and appreciates the contributions of others, demonstrates professional behavior, and communicates responsibly to build trust in relationships, shows kindness and compassion to others, focuses on others and their needs. Supports an inclusive environment and embraces different backgrounds, perspectives, and customs, develops self-awareness to understand own worldview and addresses own assumptions and biases, understands the worldview of others and develops skills to meet others’ cultural needs. Creates ideal experiences and raises standards through personal development, investing in others and continuous improvement to achieve exceptional outcomes, identifies opportunities to make improvements, sets and follows high standards of service and care, participates in performance improvement activities, reduces non-value- add activities. We’re doing work that really matters. We are advancing the forefront of health every day by bringing research to reality and advanced care closer to our patients. Welcome to the forefront. UChicago Medicine is continually recognized as a leader in medicine — both in patient care and research. Learn why we are at the forefront of medicine. UChicago Medicine’s growing network of primary care doctors and world-class specialists is closer than you think. Schedule an appointment with a doctor near you at one of our locations. UChicago Medicine is committed to improving health and wellness in the 12 ZIP codes where our neighbors live, work, learn and play. Through valued partnerships, UChicago Medicine leverages the strengths and talents of existing community relationships to address chronic conditions and other complex health needs on Chicago's historic South Side. UChicago Medicine is one of the nation's leading academic medical institutions. We have been at the forefront of medical care since 1927, when we first opened to patients. 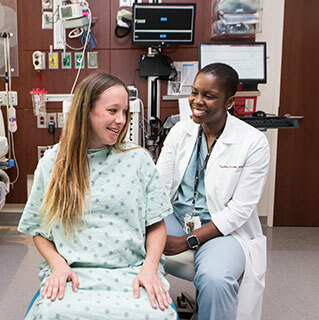 At UChicago Medicine, providing highly effective, safe patient care is central to everything we do. Here, teams of experts work together to ensure we follow the highest standards for quality care — from preventing infections and continuously improving surgical care to achieving high success rates and patient volumes for even the most complex procedures. UChicago Medicine is home to physicians who are pioneers in their fields, bringing research to reality and making the extraordinary possible. From breakthroughs in immunotherapy to game-changing orthopaedics, we bring you the most advanced health care treatments.